While we try to keep everything together, some silent auction items were misplaced. I have a few of those items. But there is a sashiko kit missing. This entry was posted in MVQ, UFO Auction and tagged UFO Auction Missing Items. Congratulations to Stacey Caruso, Sue Spinelli, the committee members and all the volunteers for a successful UFO Auction. There were lots of donated items to be had. Members and guests were bidding often and generously. The final numbers are not in yet, but the preliminary numbers appear to be very good. We will have the final numbers at the March meeting. I hope everyone had an opportunity to purchase a new treasure. I know I did! Thanks, again, to the entire UFO Auction team on a job very well done! This entry was posted in Meetings, MVQ, UFO Auction and tagged UFO Auction. We are also accepting donations at this time. Please note: The guild can only accept cash or check for winning bids at auction. This entry was posted in MVQ, UFO Auction and tagged UFO Action..
Carrie Zizza’s workshop has been changed FROM Saturday, February 23rd TO Saturday, February 16th from 9:30 to 3:30 due to a scheduling conflict on her end. The location will be announced at the January meeting. If anyone is interested, please email me NOW since we will be so close to the workshop by our January meeting. The location I choose is dependent on the number of people signed up! 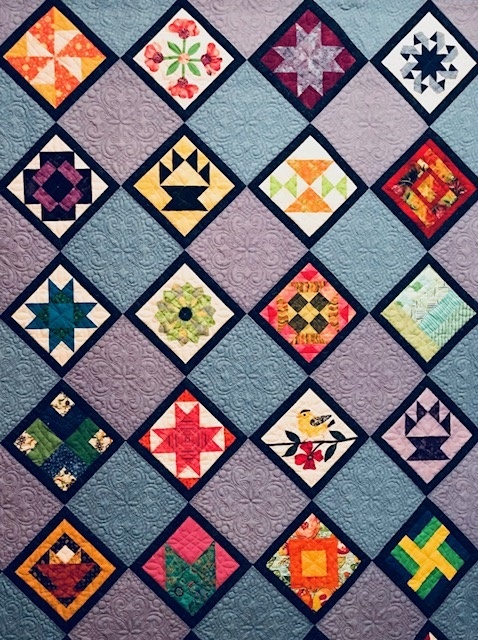 Remember – this fabulous workshop – “You can have your quilt sandwich and finish it too” – is only $10 for members. It’s a wonderful opportunity to learn from a master machine quilter. This entry was posted in MVQ, Programs and tagged February Workshop. Button Button, Where is your Button? For the December MVQ guild meeting, you were given a button to make something that fits into a brown lunch bag. This button will represent a color you have to use in the item you make. If possible, use the button somewhere, but if you can’t, please safety pin it to the back of the item so the person can see what color you had to work with. And, if you have lost your button, find another, make something to swap, and bring it with you to the Pot Luck Dinner December 6th. Be creative! Some ideas from last year include pincushions, needle cases, aprons, small wall hangings, holiday ornaments, wool items, mug rugs, placemat, and the list goes on. Last year we probably had 95 % participation and the creativity was awesome. Let’s aim for 100 %! This entry was posted in Guild Activities, Meetings, MVQ and tagged Holiday Party. A few pictures from the October 18, 2018 meeting can be found here. This entry was posted in Meetings, MVQ, Show and Tell. This is a reminder that there is a board meeting scheduled for Wednesday, October 3rd, 7:00 PM, room 201, West Congregational Church, Haverhill, MA. All members are welcome to attend. This entry was posted in Board Meetings, Meetings, MVQ and tagged Board Meeting.